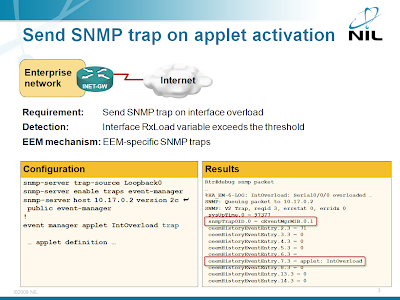 The SNMP trap contains the trap OID set to cEventMgrMIB.0.1. The .1 suffix indicates the trap was sent by the EEM server not by applet/Tcl policy code. The rest of the trap data is a copy of an EEM history event table object. One of the fields (ceemHistoryEventType1) contains an index into the event description table, another field (ceemHistoryPolicyName) the name of the EEM applet that triggered the trap. event syslog occurs 1 pattern "%BGP-5-ADJCHANGE: neighbor. *vpn vrf.*Down. *"
action 010 set neighIp "none"
action 011 set neighVrf "none"
action 012 set ifname "none"
action 013 set ifDesc "none"
action 102 cli command "show ip route $neighVrf $neighIp | include , via"
action 104 cli command "show interface $ifName | include Description:"
action 200 puts "$ifName DOWN ($ifDesc)"
action 201 snmp-trap strdata "EEM detected $ifName DOWN ($ifDesc) on $_info_routername"